Nearly universally we measure the value of growth using some version of the Gordon growth model. We notice that value doesn’t change linearly with growth, so adjusting a valuation multiple to control for growth by dividing by growth (as is done with P/E/G) leads to bias. Damodaran details this effect. 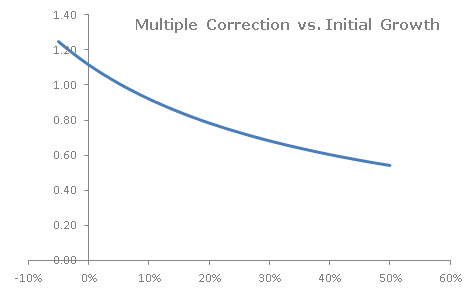 So we desire a more principled technique to adjust valuation multiples for differing growth assumptions. To do so we will convert the growth projections of the company (which start high, and then revert to 5.5%) into a value-equivalent stream of flows which grow at a steady rate. We then re-value this adjusted stream of flows using a common growth assumption (again, 5.5%) to see what the firm’s multiple would be if it were only growing at this common rate. We use the H-model, which assumes that the initial growth rate reverts linearly to the sustainable growth rate. The H-model also provides a closed-form valuation equation. This in turn gives us r, the riskiness of our firm. We implicitly assumed that the firm’s risk doesn’t change. If growth is expected to begin high and then fall, we should expect risk to decline as well. You definitely hit it on the head with this one – growth assumptions off to infinity badly skew results particularly in times of low discount rates and growth rates approaching the discount rate. Baaad mistakes are made that way.